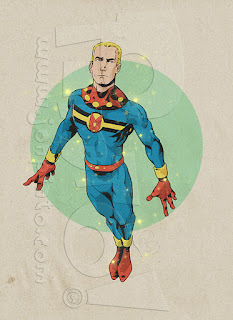 Been a long time since I drew a picture of Miracleman. Unfortunately I had, once again, more free time than I cared for while sitting at a table during a convention. I used an app to pose a figure and found that to be really helpful and I have to remind myself that I am NOT one of those awesome comic artists that can draw human figures so well out of their heads and that I use reference. Still learning I guess. Miracleman. Plus the actual pencil drawing and the digitally inked version too! Here is a picture I drew while manning my table at a convention this past summer. I was pretty happy with the drawing so I naturally wanted to digitally ink and paint it up. The only down side is that I wish I didn't have enough of that free time to draw a picture!! Oh well. 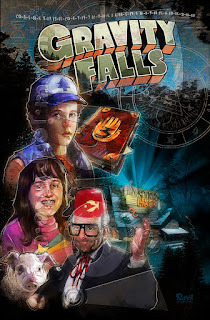 I LOVED the show Gravity Falls. My whole family did! Not often you get a show that is so clever that not only do adults and kids can enjoy it but the re-watchabilty is that high too! My son really enjoyed going back and looking for clues in past episodes that were revealed later on and how characters showed up in the background early on to not really play a part until later on. The time traveler is the obvious example that comes to mind. For quite some time I have toyed with the idea of doing a Gravity Falls picture and it just seemed like it was time but the question was how to do it. To keep them looking like their cartoon images or to "fan cast" them. I obviously chose the later. I hope you like my casting as well as the picture! PS- Can you crack the code?? Here are two "doodles" really. The first is an attempt at a retro looking Superman drawing reminiscent of Jack Kirby complete with some half-tone dots and Kirby Krackle!! This is always fun to do even if the end result was not exactly like I had planned but that's OK as I still consider this a sketch. 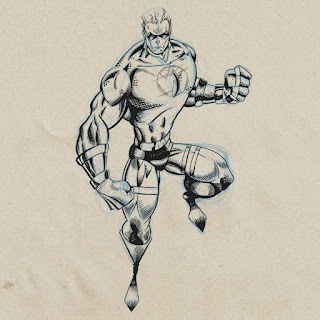 The other is a blue line pencil drawing of Superman. I was pretty pleased the way it came out and I thought it would be fun if I had a friend of mine (who happens to be a REAL comic book inker that actually inked some Superman) to ink it. Unfortunately I sketched this on an OLD pad of paper that is not only yellowing with age but is not suitable for inking as it would spread and bleed. So the inking aspect will have to wait a bit but I do hope to have that done still. Let me go back in time a bit. 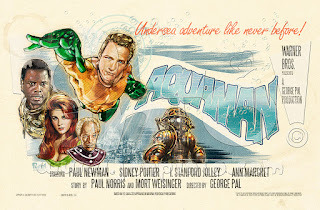 Remember my Paul Newman Aquaman (if you don't, shame on you!)? Well as a warm up for that, I worked up on my phone another of the retro-casting movie posters. 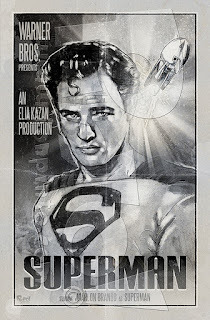 Seemed like an obvious choice to have Marlon Brando play Superman as he is so well known for being Jor-El in the 1978 movie version! The thought of a young, brooding Superman set in the 1950's seems like such fun! I kept the design for this pretty simple and I did cheat a bit and added a slightly modified rocket from my Flash Gordon poster. This is the picture that people have been asking me for at conventions for quite some time. The problem for me was that I was not a big fan of the character. I remember when he first showed up in the comics and it kind of annoyed me that he was ( at least what I perceived to be) a rip-off of a DC character called Deathstroke the Terminator that was popularized in the New Teen Titans Comic. So I pretty much wrote him off and never imagined he would still be around all these years later. I did finally watch the first film that came out a few years back (although at this writing, I have still not seen the sequel but probably will) and found that I liked it more than I thought I would. My wife Mindy even liked it! So I thought, why not! I really had fun making the menu used as the backdrop too as I got to hide a lot of gags in it. I will post a clear shot of it as well so you can see them all if you wish. 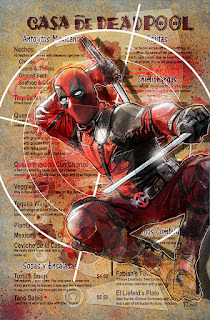 So without further delay, Deadpool. 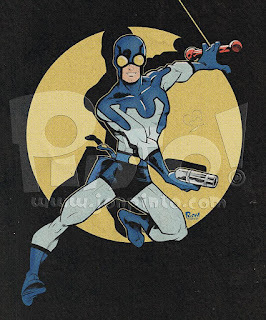 I fell in love with the Blue Beetle when I was a kid. A friend of mine had several old Charlton Comics which mostly included Steve Ditko versions of Captain Atom and the Blue Beetle! I was awestruck right away and always wished that he would have traded me these books! I originally found a beat up copy at a small show I was at and went back to my table feeling inspired to draw. 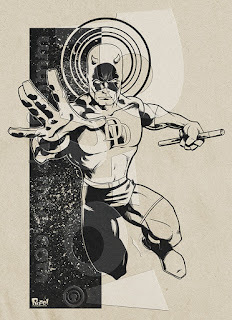 I had an old, yellowed drawing pad and proceeded to pencil a picture of Blue Beetle. So much fun. When I returned home I decided that I need to ink and color my picture digitally. Here is the result. Here is another one that I failed to post here and is long overdue. 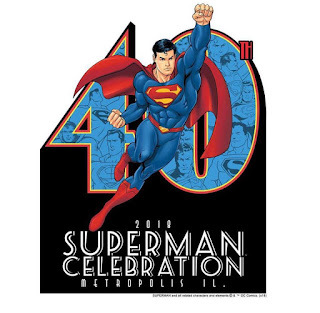 When I was preparing to go to Metropolis Illinois last month, I squeezed in some time to make an extra Superman print as the star of Superman Returns would be one of the celebrity guests, Brandon Routh. This is what I came up with. While I am not a huge fan of the movie, it did contain some really cool moments, one of which was the homage to Action Comics number one. 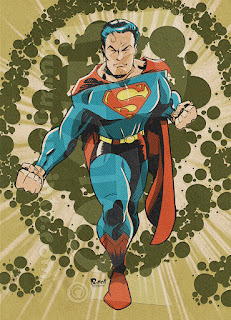 So here is my take on Superman Returns. 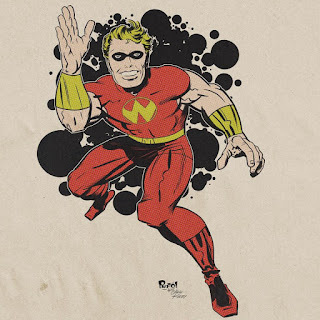 Maybe Kirby STYLE Wonderman is more appropriate. 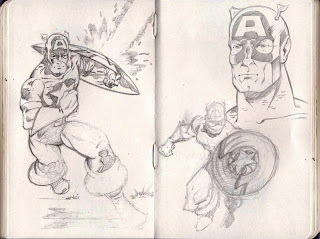 After I did the Wonderman, Silver Age Wonderman and the Liefeld Wonderman, I felt I needed to do another and what else could I do but a Kirby one. Trying to draw like Kirby is fun and very challenging! I think I came pretty close with this one. I really LOVE the ink only versions! This one needs to be under a header of "I should have posted this a long time ago!" In fact, there will be many a post like this as I have been very forgetful about posting here as I post on the other social medias. Part of that stems from the fact that I don't think many people are still reading blogs, but since my "web address" leads here, I need to keep it current unless I can come up with a better alternative. But I digress. Here is a "classic" movie that I loved as a kid and have not seen in years. My wife and I watched the remake of it but I didn't really care for it much. I did this on my phone bit by bit over a period of time. One of those things that you keep on hand just in case you get really bored as your wife is shopping for shoes or something like that. Once I started posting parts of it I immediately got feedback that I HAD to include the robot owl. So I did. 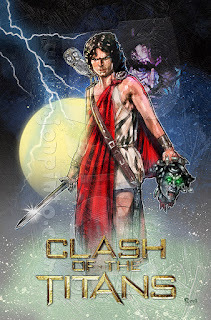 Here is Clash of the Titans. Enjoy! Another classic character that I fell in love with as a child. I think I have seen just about all the Zorro TV shows and movies, in fact I remember my mother taking my brother and I to see "Zorro, The Gay Blade" in the theaters way back in the day. Times have changed. 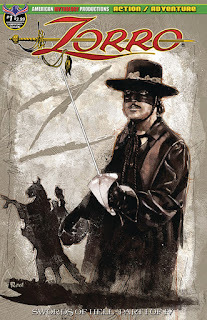 Recently I was fortunate enough to supply some covers for a new Zorro comic book from American Mythology, and since the second one has been announced it should be safe to share now. No, not THAT Aquaman. Several months back a few friends and I were having a discussion over dinner in Chicago and played a game of "who would you cast". The only thing was it had to be cast back in time. Many ideas were sprung and it was a fun night. Afterwards I set myself up to doing a few of them as posters. The first one I wanted to do was Paul Newman as Aquaman. He was our ideal choice for the lead but I got to cast the rest of the movie myself. I also really liked the change of pace it gave me and made me work in a retro style for the art as well. So what do you think of our casting? What do you think of the poster?? Yup! Time to fill up a post with pages from my sketchbook. So I recently discovered public domain superheroes. I've been having a blast reading about these forgotten heroes and why some of them went away. There are FB groups that have participants share their versions of these characters. 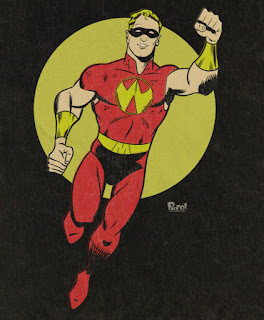 I was particularly taken with The Wonderman. Appearing shortly after Superman he was the first character sued by DC and he never appeared again! Plus he was written and drawn by Will Eisner!! 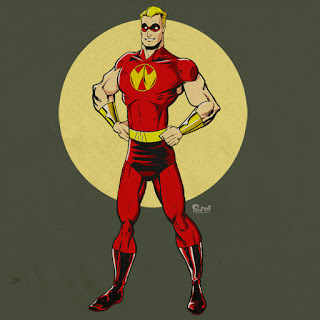 So, here is my attempt at an update to The Wonderman. Here is the cover to his only appearance and you can see what he looked like. Oddly enough, he doesn't sport a mask on the cover and it didn't appear in the book until halfway thru with no explanation. The girl in the story also has a name change halfway thru!! While there were many highlights from the event I would like to point out two very special ones. 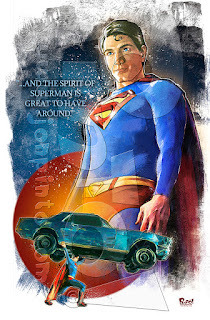 First is giving a big thanks to Jim Bowers of CapedWonder.com for not only his friendship and help but for also going out of his way to have a piece of art I did get signed by so many celebrities from Superman: The Movie! This piece was done by request for a show in Kansas and it includes so many signatures including the late Margot Kidder. I can't thank you enough Jim. 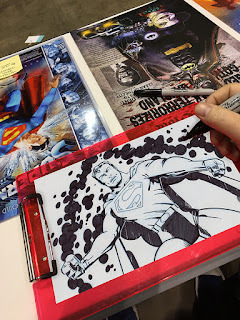 I have had several discussions between myself and peers about why I don't draw at conventions so I thought I would expand here as it's slightly complicated. 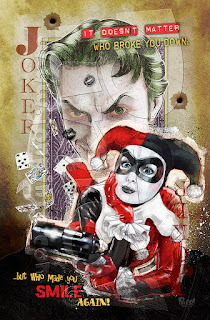 I shy from commissions during the convention because the expectation is that the customer will get something resembling my painted prints and that is simply not doable in the time allotted for a commission. My portraits take up to four hours to do. But I do draw at conventions. Usually in my sketchbook and I have been known to do a quick sketch in a book or such for people but honestly I'm not even asked very often. I'd be inclined to honor a request if it was a Superman drawing but not a Henry Cavil portrait. Make sense? 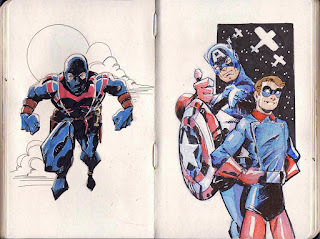 Anyway, here is a sketch I did at C2E2 with sharpie on an old comic backing board. Has to be an old one, the new ones are too slick. I then digitally retro colored it. Enjoy.